Over the last several months, you have read and heard me talk about our pending company name change. Well the day is here. Our name, official this afternoon, is now Airbus DS Communications. When our parent company, EADS, rebranded to Airbus Group last year and consolidated its defense and space businesses into one division - Airbus Defense and Space (Airbus DS), we became a part of that division, hence the name change. While only a name change, I view this step as a signal of how far we have come and the work we do everyday to earn your trust. As part of the Airbus Defense and Space division called Communications, Intelligence and Security, we will continue to add to our arsenal of public safety solutions. And there is more to share. In addition to our company's name change, next week at APCO, we are renaming our products and putting them under the VESTA® umbrella. We are excited about this because it simplifies our product names and gives us the foundation on which to continue to build our Next Generation Public Safety Communications products. Something you will frequently see alongside our new name are three words - home of VESTA. This simple phrase is meant to remind all of us that together we are building and evolving one of the best product portfolios available for public safety. If you're coming to APCO, please stop by our booth, #1019, to see the current release of VESTA® 9-1-1, our call processing system; our soon to be released VESTA SMS application; our open, standards-compliant VESTA Radio system; and for the first time our integrated demonstration, showing how one service provider can meet your needs for NG9-1-1, Land Mobile Radio and Notification. Expect to see all of this from the same smiling faces you're accustomed to, who are ready to greet you with open arms. Because, even with all the changes afoot, the bottom line is that who we are, what we stand for and what we promise do not change. CRITICAL MATTERS™. What is critical to you matters to us. 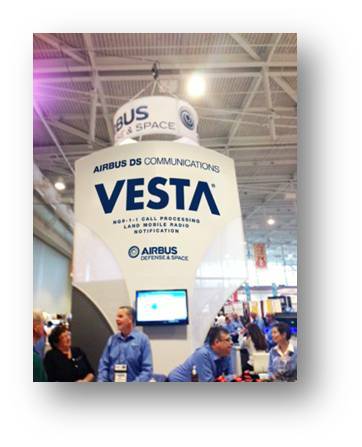 We know we need to earn your trust everyday, which is why our three promises are front and center for every employee at Airbus DS Communications, the home of VESTA. We keep people connected WHEN IT MATTERS MOST. We design WITH AN OPEN MIND. We create smarter ways to KEEP ALL OUR COMMUNITIES SAFE. We have many opportunities in front of us. With CRITICAL MATTERS as our anchor, let our new company name and the home of VESTA signify a new era in working together to keep you connected when it matters most.